Food Network’s localization of Iron Chef continues to prove that there’s more Japanese TV worth bringing over than just the anime. 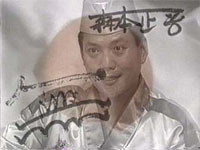 For the uninitiated, let me explain the Iron Chef phenomenon. It begins with a legend… “Five years ago, a man’s dream became a reality in a form never before seen: Kitchen Stadium.” The fictional millionaire Chairman Kaga created this elaborate arena to pit chefs against each other in one-hour kitchen battles. Then he “secretly gathered” four top chefs of different cuisines to become his Iron Chefs: Iron Chefs Japanese, Chinese, French, and Italian. Each week Chairman Kaga seeks out (or in some cases he is sought out by) a world-class chef with some unique specialty or personal history. The first five minutes of the show explain the back-story of this challenger; why he or she is the top chef in the world at cooking with sake, or how he or she was trained by some great French master. It’s quite impressive how exciting these stories become when they are dynamically edited together with dramatic music (sometimes anime sountracks!). There are even a few “story archs” within this food drama in which certain cooking factions send a series of chef “hit men” to “take out” the Iron Chefs. You’d think they were all actors if it weren’t for the world-class cuisine that they prepare. The challenger picks one of the four Iron Chefs to battle against, or in rare cases, the Chef is chosen for them that will best match their skills. Then, in a cloud of smoke, Chairman Kaga unveils the secret ingredient than they must use in all of their dishes. Now the stage is set. The chefs have one hour to create as many world-class dishes as possible with the main ingredient. If your ingredient is squid and you want to make a dessert, you better make damn sure that your dessert has squid in it. Trust me- weirder things have happened. While the chefs do their thing, commentators Dr. Yukio Hatori, Fukui-san and Otah play tag-team with the narration, giving more analysis per move than you heard in the Superbowl. After 60 minutes have elapsed, the dishes are presented to a celebrity panel. Why they have a fortune teller judging food on every other show, I don’t know. Unless you’ve lived in Japan, you probably won’t recognize the guests, but they certainly act like celebrities, and hearing their reactions is quite amusing. After they take a secret ballot, Chairman Kaga presents the results in a dramatic drum roll ceremony. If you’re chest isn’t pounding at this point, you probably don’t have a heart. One of the first new episodes is sure to become an instant classic. In the Black Pig battle, Chairman Kaga boycotts his own competition to protest the fact that his Iron Chefs have lost six of the last nine matches. His presence is sorely missed, but in a very WWF twist, Kaga is rumored to have been seen somewhere on the premises. The French versus Chinese cooking battle is quite intense, featuring whole black pigs as the ingredient (Fortunately for the SPCA, these animals are already dead before the match, unlike the infamous octopi). The cooking in this match gets a B+, but the drama outside the kitchen is quite possibly the best ever. This episode gets a solid A. In the next new episode, Iron Chef Japanese, Masaharo Morimoto, takes on a fearsome Canadian chef in the second potato battle shown in America. It’s neat to watch a westerner take on an Iron Chef, but potatoes are such a mundane ingredient that this battle isn’t as exciting as the last cross-Pacific lobster battle with the victorious San Francisco chef. Overall, I’d rate this episode a B, not because the food looked bad, but because too many dishes looked like stuff we could make at home. The final new Episode of the season that I’ll look at is the very first Sushi battle. It took nearly eight years for Chairman Kaga to hold a sushi battle, but this episode shows you why. Sushi may be tricky to make at home, but the prospect of two professional chefs making five sushi dishes in an hour is less than thrilling. I mean, it takes a chef just a minute or two to make me sushi at a sushi bar, so while the Iron Chef and Challenger have more prep work to do here, it just doesn’t appear that difficult. This time Morimoto, famous for his neo-Japanese style, takes on a traditional Edo-style sushi chef who was personally recommended by a famous actor. The Challenger’s dishes are pretty standard sushi fare (although I bet they taste much better), but the Iron Chef’s scarcely resemble sushi at all. It’s neat that to watch the chefs battle with five secret ingredients, but it’s still a let down compared to other battles. Only the dramatic involvement of the Challenger’s actor-patron keeps this one from being the most boring episode ever. This one gets a C.
This season promises to be better than the last, especially if they get up to the final Japanese episodes in which the Iron Chefs battle each other! The only problem that the Food Network faces with Iron Chef is that they started airing only the last two years worth of episodes. There are only about a dozen more episodes left until Food Network catches up with Japan, where Iron Chef is finished as a regular program. There are a good five years worth of episodes with some different chefs and slightly lower production values that aired before the translated episodes; will they ever see the light of day in America? I hope that Food Network airs these “lost” episodes rather than try to make their own American version of the show (which I expect they’re already working on.). Whether it’s a fad or here to stay, Iron Chef is a welcome addition to American TV. It’s quickly becoming as big a part of pop culture as South Park and Dragonball Z; it even had a Saturday Night Live sketch (their funniest sketch in years) with Charlie Sheen making shark head bagel pizzas. Even if a cooking show is the most boring program you can think of, do yourself a favor and watch just one episode. Consider it part of your cultural literacy training, but you never know, you might just get hooked.